If tired WMD lies won't convince the public to back foreign intervention, perhaps recycled lies from Libya? July 24, 2012 - The Telegraph has reported (emphasis added), "fighter jets have reportedly launched bomb attacks on Syria's second city of Aleppo, which, if confirmed, would be the first time Assad forces had used war planes against citizens." Image: A sole"tweet" from BBC's Ian Pannell, who has yet to provide any source, evidence, or details regarding his vague claim, immediately made headlines across the Western media. The claim is based on a single "tweet" from BBC's Ian Pannell who, after hours of making his his claim that, "fighter jets have bombed eastern #Aleppo city. A significant escalation and perhaps the first time they've been used in #Syrian conflict," has failed categorically to cite his source, provide any evidence of his claims, or provide details of the targets and context of the attacks, if indeed they took place. Yet the Western media "echo chamber" began repeating the story seconds after it was posted, and through this alone it attempted to validate the claim while building momentum behind NATO insinuations. 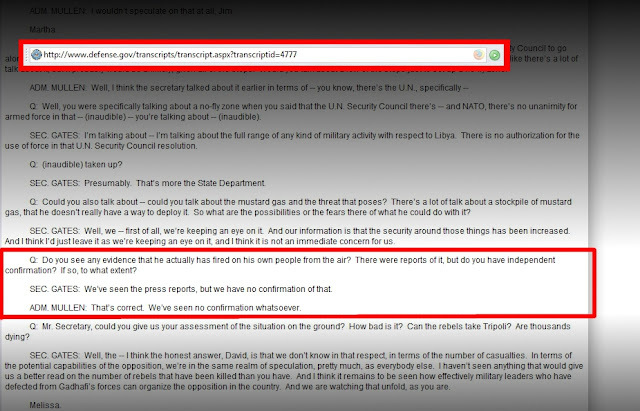 Image: Taken from an official Defense Department transcript, the US Secretary of Defense Robert Gates, and Admiral Michael Mullen both concede they'd seen no confirmation "whatsoever" regarding claims by the corporate media that Libya's Qaddafi had used airstrikes against his own people. However, this fabrication would be used for very real airstrikes, not by Qaddafi, but by NATO under the guise of the "Responsibility to Protect." Narratives of "brutal dictators" bombing civilians with aircraft have been used before, most notably in Libya where verified lies were told regarding Qaddafi's use of aircraft against the city of Benghazi. These fabrications were used to justify foreign military intervention and regime change under the guise of a "no-fly zone" to "protect civilians." Ironically, NATO's subsequent "protection of civilians" flattened several cities across the country, slaying thousands of civilians. The Syrian military cannot, however, rule out the use of airstrikes considering the overt manner in which foreign interests such as the US, Israel, and the Gulf States are increasingly sending heavily armed militants over their borders to destabilize their nation. It must be taken into consideration that FSA militants have been conducting indiscriminate bombings across Syria for months now, and with their latest assassinations and offensive, have shed the ability to play to role of "victim-civilians." 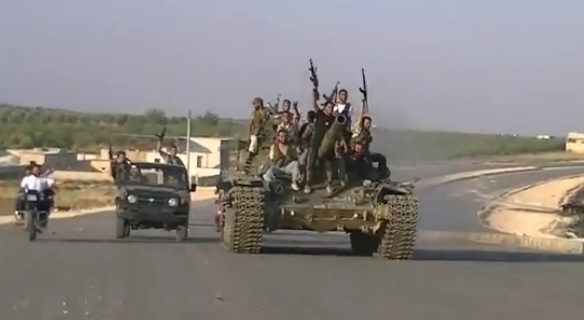 Image: The West's "lightly armed" FSA. ABC (Australia) claims this is a picture taken this week of an FSA-seized tank on the outskirts of Aleppo, Syria. One wonders if this tank was rolling along the outskirts of Washington in the middle of a war, whether or not the US would use airstrikes to neutralize it. The West has eagerly described this violence in Syria as a "civil war," yet has conveniently continued to depict their heavily armed, foreign-backed fighters streaming across Syria's borders as "citizens" and "civilians," even as their ties to Al Qaeda and other foreign militant groups become ever more apparent. In fact, Iraqi officials are already linking the recent bombings in their country by Al Qaeda to the same forces and backers of the so-called "Free Syrian Army" (FSA) in Syria. Image: Al Jazeera was running this picture along with the description, "Syrian rebels near Aleppo city, as they took much of the formerly loyalist city from the government [EPA]." Heavy weapons can be seen mounted on several of the trucks, and images like this are increasingly common as militants attempt to enter cities like Damascus and Aleppo where there are more cameras, and hiding these weapons from the general public becomes increasingly difficult. 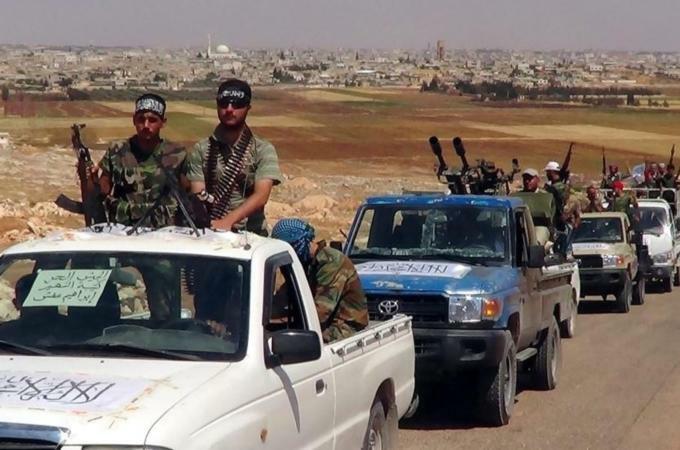 Additionally, despite a repeated mantra by the Western media that the FSA is "lightly armed," these same media outlets have shown columns of trucks mounted with heavy weapons, and even captured tanks identified as FSA forces. While the US conducts airstrikes on entirely unarmed civilians in Afghanistan and Pakistan, and with Turkey likewise brutalizing its own "rebels" in Kurdish dominated provinces from the air, NATO and its allies attempt to condemn Syria for doing likewise against heavily armed militants like those pictured above. Between lies revolving around distorted statements regarding chemical weapons, fabricated atrocities, and now claims of airstrikes being used upon "civilian populations," the West is desperately running down the list for a "casus belli" that will stick. The Syrian government, after a year and a half of being undermined by foreign interests and hordes of foreign militants, has maintained both the faith and trust the majority of its population has put into it. If it is deploying airstrikes, it can be assured they are doing so with keeping that faith and trust intact - and as the West often claims in the midst of its military adventures, doing so to minimize as much as possible collateral damage. Recent attacks by the FSA have aimed at undermining that faith and truth, and militants in the northern city of Aleppo have purposefully moved to the commercial center of the city to draw in the heavy weapons necessary to neutralize them. While the Western press portrays this move toward the center of Aleppo as "progress," it should be noted that the Syrian military operates out of bases on the city's outskirts. This means the further militants push toward the center of the city, the further from engaging the military directly they become. While the FSA claims they are "liberating" Aleppo, even the Western media concedes it is a bastion of government support. This indicates that terrorism, intimidation, and panic, not "liberation" are the FSA's goals in Aleppo, and that the government is justified to take any measures necessary to stop them. Conversely, NATO and its allies see Syria's vigorous defense capabilities as an obstacle to Western-planned regime change - therefore if neutralizing them through covert means is not possible, they will attempt to neutralize them by declaring them a threat to "civilians," invoking "Responsibility to Protect," and initiating foreign military intervention.